Hello Lovelies! This is my last week before the Easter holidays, and I cannot wait for a break. Well I say break, but in reality I'll be studying, studying and more studying, but it's all worth it for the lie ins right? For this week I was feeling just a little bit austere and flamboyant, hence the bold colour choices and extravagant pieces. It is totally over the top, but honestly I just love it. 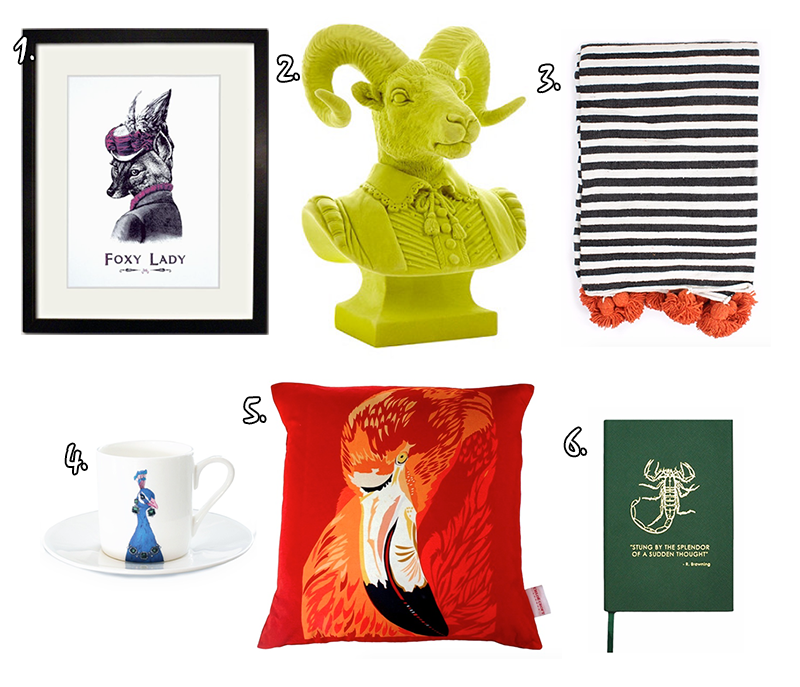 This week's picks are from Wolf and Badger, Chase and Wonder and Debenhams. 1. Fox Lady Screen Print £39.99 [x] : Don't even ask me why but I love prints like this of animals wearing old fashioned clothes - is it just me? 2. Abigail Ahern Lime Regal ram bust £60.00 [x] : If you're looking to go all out and make a big statement in your home, what is better than this ram bust? I love that it's in this bold neon colour too. 3. Bohemia Orange Cotton Stripe Pom Pom Blanket £115.00 [x] : I'm in love with this bold stripe blanket, and especially its flamboyant pom pom details. 4. Perky Peacock Espresso Cup £20.00 [x] : Is it weird to wish you were as sassy as a peacock, because come on look at this one - it's even wearing earrings. Just a little bit too cool. 5. Flame Flamingos Cushion £55.00 [x] : For a bold beautiful cushion, go for this flame flamingo one, just so gorgeous! 6. Sloane Stationery Scorpion Notebook £29.00 [x] : 'Stung by the splendour of a sudden thought.' This notebook is pretty much the epitome of luxury (I mean look at that price tag) but I love that about it. Thank you for reading lovelies - and have an amazing week! The photo frame looks great! The expresso cup is sassy indeed! I don't drink expresso, it's way too heavy for my liking but I would buy that just for decor! That ram bust is incredible! I'd definitely love to have something unique like that in my home!